Oh guys! I hope you are all having a great Saturday. I had such a wonderful week, that I wanted to share some of those wonderful and bewitched moments with you. Especially in light of our 3 Year Blogiversary, I wanted to post a happy post today! This last week showed me again, how much Book Blogging makes me happy. And it’s not about books or items I get – it’s what is beyond that. The love for a story. The love for an author. I feel incredibly lucky to have a chance to interact on such a personal level, with authors, publishers and other bloggers!! I was screaming when I got the package! You might remember how fangirly excited I was about Of Poseidon last year. I was honestly hugging the book when it came! One day, I even color coordinated my clothes with the cover. Or it was rather, I was dressing myself and then I realized – holy cow, my clothes match the cover perfectly! You have to be a real geek to even realize such a thing.. I can’t express my love for this book and Anna Banks! I just wish at some point I could meet her…. And just so you know.. Of Triton was FANTASTIC!!!! I got such a cute package from Macmillian and .. I was confused as I didn’t expect any books. But, wowoo when I opened I was so beautifully surprised! I got a bright red Scarlet Hoodie and some other goodies. It’s sooo snuggly and cute I love it!! Just like Of Poseidon, Sweet Evil totally blew me away last year. During the time the sequel was up in the air I was so sad that I came into contact with Wendy Higgins. This lead then to the Cover Design contest where the winner could win to become a character in Sweet Peril. I was so excited when Wendy was loving this idea and going with is. I did it because of the love for a book and because Wendy is such a sweet and wonderful person. I had no idea that this contest would attract sooo many people and fans. But then… the biggest thing ever happend, because Wendy decided to not only take the winner’s name Jenny (Supernatural Snark) but also mine and Tara’s.. I couldn’t believe it.. This is the most epic thing ever. So this week, Wendy send me an ARC. And.. I was so touched and emotional – I had tears in my eyes! (No kidding, I’m a cry-baby). Not only did Wendy sign the book, but she also put me in the acknowledgment. Hello? Me? I was so stunned I was tearing up! Then.. I found the scene where Wendy put in Jenny, Tara and me (Daniela)…. I was speechless! She not only took our names but also gave me an european accent making this whole scene even more surreal for me. I’m still not believing it and you can all bet that I will frame this copy!!! So yes, all these moments were full of magic.. and just bewitched! Something I would be able to experience if I wouldn’t have decided 3 years ago to start Book Blogging. I feel so lucky and all this just makes me life a little more wonderful and I am thankful for this experience! So guys, after I shared my bewitched moments, do you also have moments where you were so touched? Please share with me, I’d love to hear all about it! P.S. : Don’t forget to enter our 3yrs Blogiversary Celebration Giveaway of a Kindle Fire! « Short & Sweet – Meet Gennifer Albin Author of Crewel and get Crewel for only $2.99! Wow! Awesome Danny! It’s always so nice to get books and swag in the mail. And having a character named after you is a whole ‘nother level of cool. Did you have any big multiple choice tests as part of your PhD or was it only the dissertation? I know some PhDs have a big test at the midpoint of the degree…I forget what they’re called. Oh wow that sounds super intense!!! Danny recently posted..Discussed! Magic Moments in Book Blogging! I know!!!!! I feel so so blessed and still cannot believe it !!! And I’m sooo excited for you and yes I totally understand crying :))) It’s such an emotional moment right? These magical moments really are the cherry on top when it comes to blogging 🙂 That’s so cool you’re immortalised in a book! 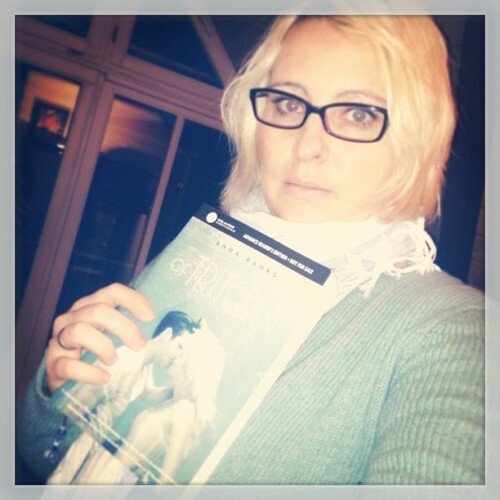 Charlotte @ Gypsy Reviews recently posted..Discussion: Classics – Read or not to Read? Happy soon to be three year blogoversary! Wow three years. Does it feel like its been three years? I’ve only been doing it for less than a year but I feel like I only started this whole thing two days ago. Anyway, congrats and keep on keepin on. Thanks for fangirling with me!!! It’s such an amazing thing I still can’t believe it!! AWESOME!! I love that Higgins included you in her book — I know how much you loved the first one (which, I’m sad to say, I still haven’t read! Bad girl.). Happy blogoversary!! AHHH how cool!!! I’m incredibly jealous of having your name in Sweet Peril! That contest was amazing and you totally deserve it. AND OMG for Of Triton!! I’m so excited to read that one too. I love those magic moments in book blogging!!! Awww this is such an amazing post!! I LOVE IT! I’m so jealous you’ve read Of Triton, and that Scarlet hoodie is AMAZING, and Wendy Higgins is like the sweetest person ever!!! DANNY!!! LOOK HOW ADORABLE YOU ARE!!!! 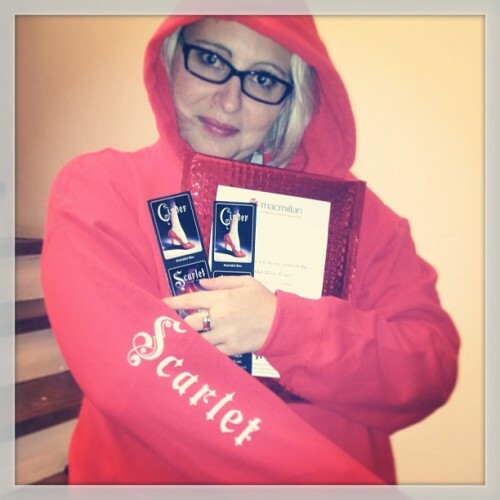 I want to hug you and your Scarlet sweatshirt:):) I’m still waiting for my copy of Sweet Peril (I think I’m getting an ulcer from the stress) but I’ve looked at the image you posted about 100 times and even sent it to the moms so they could see our names in print:) Wendy is such an amazing person, and I feel so very fortunate to “know” her. One of these days we’ll get to meet!!!! I’m thrilled you had such a magical week and happy 3 year blogoversary!!!! One of the moments I teared up and is associated with our rockstar Wendy Higgins was when she did the video announcement of the sequel being picked up by Harper and I just teared up and started happy dancing. Anna and Kai’s story needs to be told and there is just no other option! I love you for what you did for this book and I couldn’t thank you enough, Danny!!!!!! *hugs* Anyway, the most special moment for me was probably when I received a copy of Slammed and another of Point of Retreat both signed and personalized by Colleen Hoover herself. Gosh, that is still probably the most amazing moment of my blogging and reading “career”. I just love her to pieces and the fact that she sent those books to me, to Europe, to my little home country and signed them for me.. ugh. This is just unbelievable. I’d love to meet so many authors, it’s insane. I hope you’ll get to meet Anna Banks one day to make your wish come true:) Have a lovely weekend, Danny!! That is an absolutely amazing experience you had with Sweet Evil. Kind of makes me want to read the book, cause she is such an amazing author. WowDanny! You really had a fantastic week! And that is amazing that you’re a character in a book! Huge SQUEE! Wow, you have experienced some amazing moments in book blogging! I can imagine that you are ecstatic and jumping up and down from excitement. All of your hard work and love of books, reading, and authors shines through on your blog. They love you, as do your followers. Congrats and enjoy the success of all of your hard work paying off. I can’t wait to celebrate your 3 year blogiversary with you!!! Oh my god! You had a great week! That Scarlet hoodie is so awesome and looks so great on you with your coloring! Wow!! I love seeing your’s and Jenny’s names in Sweet Peril! You worked so hard to get the sequel! (I don’t know who Tara is). And it is totally awesome that she gave you your accent and spelled out your whole name. And to have your name in the dedication is totally awesome. I got my name in an acknowledgement for being such a big fan with probably about 500 other fans but still it’s awesome to see your name in a book, isn’t it? Just awesome moments and yeah I would say you look happy!